In a defiant slap at international sanctions against the regime of Syrian President Bashar al-Assad, Russia's arms trading company, according to Russian media reports, has signed a $550 million deal to sell Syria combat training jets. 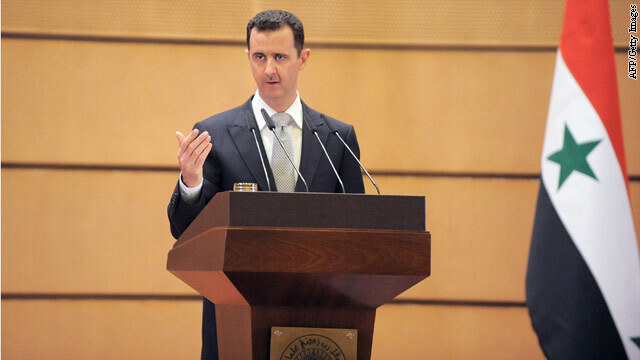 But Moscow's move may be aimed more at sending a message to Washington than with helping al-Assad. Asked about reports of the sale Monday, State Department spokeswoman Victoria Nuland said, "If it's accurate, it would be quite concerning." "Our firm belief is that any country that is still trading in weapons and armaments with Syria really needs to think twice," Nuland said, "because they are on the wrong side of history, and those weapons can be used against innocents and have been." For the first time, the Air Force has trained two drone pilots who have never flown actual planes, Time's Mark Thompson reports on Battleland blog. 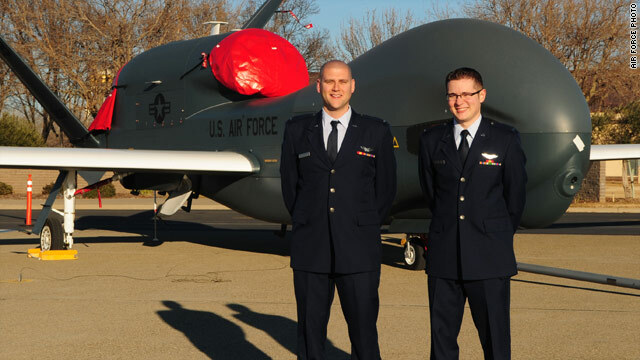 The two pilots, trained to fly the RQ-4 Global Hawk unmanned aircraft, have the designation of 18X field, signifying they don't have prior flying experience. The program at Beale Air Force Base was set up in June 2011 to train drone pilots "across the services." The two pilots will begin flying missions immediately, according to the Air Force. Curiously, Thompson notes, the Air Force posted their photo but would only give their first names – Second Lieutenants Jacob and Scott – because of "operational concerns." But the concern did not extend to their photographs, which the Air Force provided. 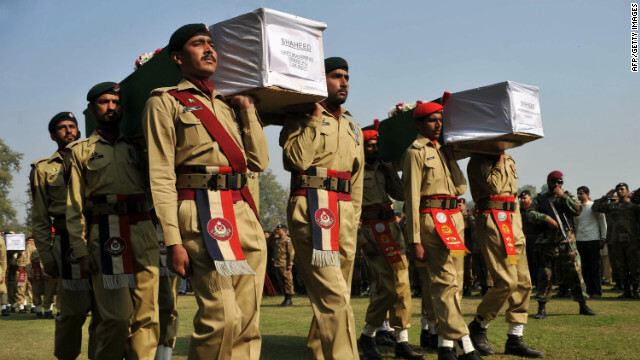 US report "contrary to facts"
Pakistan released a report Monday laying out its version of a cross-border airstrike by U.S. and coalition forces that left 24 Pakistani soldiers dead, repeating its disagreement with the U.S. version of events. "The fundamental cause of the incident of 26th November 2011 was the failure of US/ISAF to share its near-border operation with Pakistan at any level," Pakistan military's report said. The U.S. military's investigation of the event, led by Gen. Stephen Clark, says "the catalyst for the engagement was the opening of fire by PAKMIL (Pakistani military) Forces." The European Union and the United States added to the growing list of sanctions meant to pressure Iran into rethinking its nuclear program. On Monday, the E.U. agreed to cut off oil imports and freeze assets in an effort to starve Iran of funding for its nuclear program. Soon after the E.U. made its announcement, the U.S. announced it was adding Iran's third largest bank to the banned list, accusing it of providing financial services to other Iranian banks and firms already sanctioned. The move against Bank Tejarat chokes off one of Iran’s last access points to the intl financial system, our Elise Labott reports. The sanctions come after the U.S., Britain and France sent naval vessels across the Strait of Hormuz into the Persian Gulf this weekend. Iran will get some attention Tuesday night, as well. Expect tough language on Iran from President Obama in his State of the Union address on Tuesday, democratic sources tell Chief White House Correspondent Jessica Yellin. The U.S. has sanctioned 22 Iranian-linked banks, including all of the state-owned banks, according to the Treasury Department. The history of U.S. sanctions against Iran dates as far back as 1979, when hostages were held at the U.S. Embassy in Tehran. Over the years, the U.S. government has approved other sanctions. In 2010, amid increasing tensions of Iran's nuclear program, the United States instituted sanctions that U.S. officials described as "unprecedented." The United Nations and the European Union, and other countries around the world also have sanctions against Iran. Click here to read more from Josh Levs about the key steps in the efforts to sanction Iran. Fareed Zakaria GPS's page looks at why the EU efforts take a real bite out of Iranian oil exports. Government prosecutors charged a former CIA officer Monday with disclosing classified information to journalists, including the names of CIA officers involved in top secret activities. John Kiriakou, a CIA intelligence officer from 1990 to 2004, illegally divulged the name of a CIA covert officer and the role of another agency officer involved in a classified operation, the Justice Department said. He is also accused of lying to the CIA board responsible for reviewing the book he was writing to make sure no classified material was being divulged. (A copy of the complaint is here). The investigation of Kiriakou was triggered when defense attorneys for a high-value terrorism detainee held on the U.S. Navy base at Guantanamo Bay, Cuba, filed a document with the military commission in January 2009 that contained classified information about CIA officers. This secret information had never been disclosed by the government to the defense team. Over at Global Public Square, Fareed Zakaria's team has an interesting take on North Korea and Iran. In "Stuck between the U.S. and a hard place," Middle East analyst Meir Javedanfar looks at the possibility of Iran entering negotiations with the P5+1 facilitated by Turkey. If so, he asks, what would the Obama administration have to offer given the pressure from the potential Republican presidential contenders and other countries to take a hard line against Iran. Also not to be missed, Council on Foreign Relations' Scott Snyder considers "Kim Jong-un's dangerous brother," the eldest son of Kim Jong-il. Kim Jong-nam is reported to have been groomed for succession until he fell out of favor in 2001, after being detained at Narita Airport in Japan with a fake passport. As Snyder sees it, Kim Jong-nam stands to be a potent threat to his younger brother, emerging as a vocal critic of the regime. Read them both on the Global Public Square page.